School Resource Officer Deputy Monica Rice poses with Macy Beener at the Big Walnut Safety Town graduation. 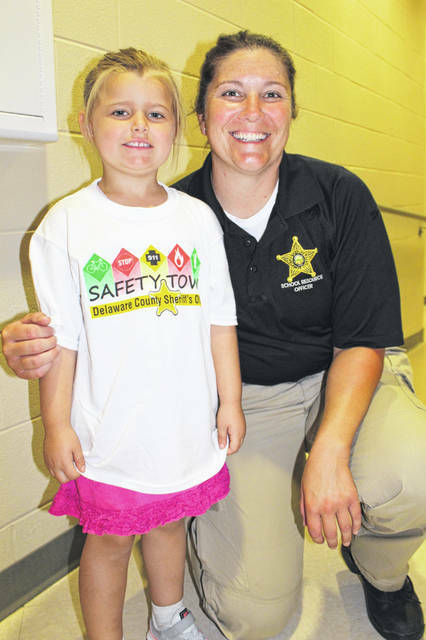 During the program, 60 youth, ages 5 and 6 from the Sunbury area, completed the week long Safety Town program, which was led by deputies from the Delaware County Sheriff’s Office. Five total sessions were held this past summer throughout the county with 250 children participating. The sheriff’s office reports local businesses helped offset start-up costs, and community agencies partnered with deputies to bring a variety of safety messages to the students, including water, bicycle, animal, stranger and electrical. The class of 2018 graduated from Big Walnut High School the evening Saturday, May 19. There was a delay for rain to pass through, and once it did, the ceremony was held outside at the football stadium to accommodate all the attendees. “We have two student speakers as a part of our ceremony, our choir will perform and our principal and superintendent will both speak,” said Christina McDonough, Senior Class Advisor, in an email. Senior exams that began May 11. Gowns, honor cords, tickets and caps were distributed, and Senior Breakfast and Graduation Rehearsal was May 18. Underclassmen had exams May 21-24, with the last day of school being May 24. Friday, May 25 was a teacher workday. Also, the Great Gatsby-themed senior prom and Scholar’s Dinner were successful, and the high school had its first Academic Signing Day on May 1 to complement athletic signing day on May 8. Principal Andy Jados said BWHS had its Senior Awards night of academic and athletic honors on May 7, had a Staff Appreciation Week, annual Student Art Show and final band and choir concert on May 9. Five seniors also attended a “Changemakers” Leadership Summit. Students taking AP courses had AP exams the week of May 7 and 14 at St. John Neumann Catholic Church. Columbus State Community College 2018 Summer and Fall was opened for College Credit Plus courses online or on one of the CSCC campuses in the Summer or Fall. On April 23, German students celebrated Maifest; and on April 24 new inductees to National Honor Society were honored. A teen driver task force talked about safety after a mock crash on April 26 (a proposed bill in the Ohio House would lengthen temporary permit instruction from 6 months to one year; and begin supervised night driving at 10 p.m. instead of midnight). Also on April 26, some BWHS students got jobs at the Community Expo that was held in the gym. Finally, nine BWHS students competed in the National Robotics Challenge in Marion April 12-13; and students learned about college choices at a College Fair in Columbus and an event at Columbus State’s Columbus campus. The 2018/2019 Student Council Members are: Seniors John Elliott, Judah Lozano, Miranda Markel, Max Muhlbaier, Julia Wood; Juniors Karley Becker, Camden Edwards, Sam Metzger-Cantrell, Jackson Podraza, Lindsey Stein; Sophomores Charlie Jaeger, Lauren Ropp, Jacob Ross, Maddy Watters and Cole Wecker. There was the Eagles’ Last Flight for seniors at the high school and Eagle Mentor Awards. BW Middle School had an end of year dance on May 11; as well as recent Coffee House Poetry; and are collecting Chromebooks and chargers from 8th graders on May 15. The 8th grade breakfast and awards program/SOAR Reward Day is May 18; and their Washington D.C. and Ohio field trips are May 21-24. Last week was also Teacher Appreciation Week. On Service Day April 27, all BWMS students and staff provided more than 2,100 hours of community service at more than 45 Delaware County locations for 3.5 hours. On May 8, 4th graders visited Big Walnut Intermediate School. The nearly 600 5th and 6th grade BWI students also put on a pep rally for the National Hockey League’s Columbus Blue Jackets during their playoff run. The April 18 event was a reward for the being the school with the highest percentage of student body completing the Blue Jackets’ STEM-focused Hockey Scholar program. Big Walnut Elementary 3rd graders recently visited the Community Library and Whit’s Ice Cream. In addition, staff read the book; Above the Line: Lessons in Leadership and Life from a Championship Season by Ohio State University football coach Urban Meyer. General Rosecrans Elementary also had a Staff Appreciation week May 7-11. “Thank you for PTO for all of their efforts in celebrating our amazing staff; please mark your calendars now to join us for the Volunteer lunch on Tuesday, May 22. We are so thankful for all of you,” said outgoing Principal Megan Rose Forman on the school’s email communications. Harrison Street Elementary had its Volunteer Luncheon May 22. HSE also has had three sessions of what it calls Eagle YOUniversity, that mixed grades to learn more about two different subjects. The 2nd grade took a field trip to the Columbus Zoo, and the 4th grade went to the Ohio Historical Society. Due to security and safety concerns, there was no longer an end-of-the-year picnic on the last day of school on May 24, with a two-hour early release. Third graders Nate Benjamin, Gabby Connor, Joey McMillen, Rylie Satterfield, McKenzie Green, Kaylee Graham, and London Steele performed music at a Community Expo. Also, the school said Eagle Mentor Awards went to Meg Wion, Chung Woodruff, and Kathleen Kildoo. Hylen Souders Elementary students saw COSI on Wheels May 15; and had a 4th Grade Clap Out on the last day of school, May 24. They also visited Olentangy Indian Caverns on May 9; Fun in the Jungle May 10; and visited Sunbury Village Square to learn about the Civil War on May 18. They also had a recent Flower Sale, and collected $800 in donations for a Pennies for Patients drive to the Leukemia and Lymphoma Society. “Work will begin this summer on our secure entrance,” Souders Principal Matt Cox said in communication with parents. “The construction will limit our ability to be in the building during the summer. I will be available through the summer via email should you have any questions or concerns. We will use a classroom as our office during the summer. I will keep families updated on the progress of our construction project. When the main entrance is under construction, signage will be posted to direct parents to an alternative entrance. Editor’s note: Due to an abundance of stories, we were unable to post this information when it originally happened, but thought it might be of interest to some readers. We will try to compile a Big Walnut story on a weekly basis going forward.